I found this post buried in my drafts from several years ago. I probably didn’t post it back then because I was afraid my boss would think I was making excuses for all the youtube videos I was watching. It takes programmers ~15 minutes to get into “the zone” when they’re working. It’s only worth getting into the zone when you can stay in the zone for a significant period of time. 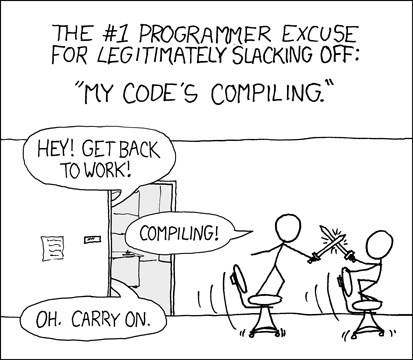 One of the most frustrating things you can do to a programmer is to interrupt her/him while she/he’s in the zone. Put programmers in an environment abounding in distractions and you’ll probably never see the programmers when they’re in the zone. You will see some work along with lots of youtube videos, articles, twitter, facebook, etc. The work you do see won’t be their best. If you’re really lucky and the programmers have no lives to call their own they’ll stay up late, working without distraction. You’ll still never see them in the zone, but the work they get done when they’re alone will not only be more satisfying to them, but to you as well. But then they come in late the next day and you hate them for it. If a programmer works in the zone and no one is around to witness it, did it happen? Probably, because you weren’t around. Go away. I’m trying to write code.